At 5.35 AM Friday, after almost four hours in flight, the aircraft landed in Mumbai. “All 130 passengers and six crew members on board the aircraft were alighted safely. No one suffered any injuries,” Air India Express said. Minister of Civil Aviation Suresh Prabhu has ordered an inquiry into the incident. Both the pilot and co-pilot have been de-rostered pending investigation. 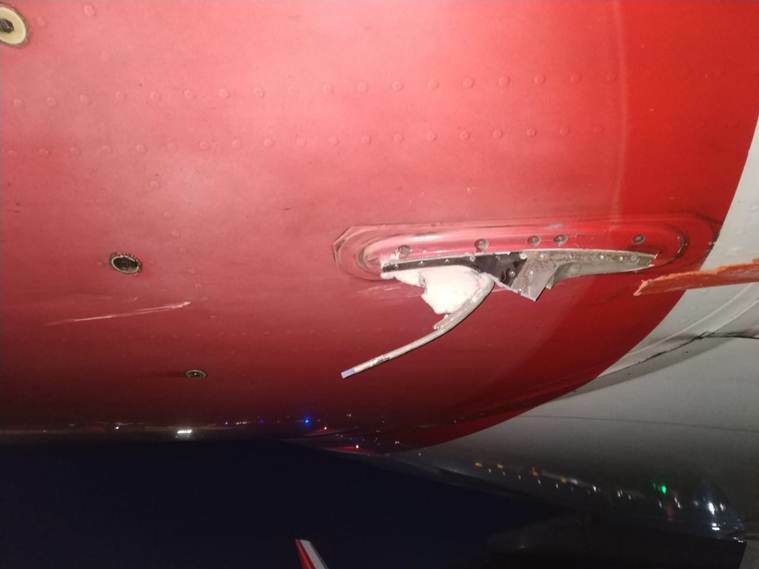 For almost four hours, an Air India aircraft with 136 passengers and crew on board continued flying to Dubai Friday with damage to its underbelly and landing gear after hitting a perimeter wall during the takeoff from Tiruchirapally Airport. While nobody was hurt, the aircraft was diverted to Mumbai as a precautionary measure. It was only after the aircraft was well into its flight path that Tiruchirapally Airport officials reported that the plane may have been damaged. The pilots had replied that the aircraft’s systems were operating normally. According to flight tracking website Flightradar24, the aircraft attained a cruising altitude of around 37,000 feet and had crossed half the Arabian Sea before a decision was taken to divert the flight to Mumbai as a “precautionary measure”. At 5.35 AM Friday, after almost four hours in flight, the aircraft landed in Mumbai. “All 130 passengers and six crew members on board the aircraft were alighted safely. No one suffered any injuries,” Air India Express, the low-cost carrier owned by Air India, said in a statement. The matter was conveyed to the pilot in command. The pilot in command reported that the aircraft systems were operating normally. In a statement, the airline said that the pilot-in-command with flying experience of 3,600 hours on Boeing 737 aircraft, including 500 hours as commander, and the first officer with about 3,000 hours of experience on the aircraft have been “de-rostered pending investigation”. Overloading is among the reasons that officials have attributed to the aircraft clipping the perimeter wall on takeoff. Reacting to the incident, Minister of Civil Aviation Suresh Prabhu said that apart from referring the matter to the DGCA and the Aircraft Accident Investigation Bureau (AAIB), he has ordered that a third party professional organisation look into various safety aspects at Air India. “In order to have continuous attention towards air safety, I have also ordered concerned officials to put in place a regular safety compliance report of all airlines. Safety of the passengers is of paramount importance for us. We will take all that is required to put safety on top of aviation agenda. Growth can’t be at the expense of safety,” Prabhu said. He also said that Air India has constituted a sub-committee of the Board headed by an independent director to look at all safety-related issues within the organisation, including its subsidiaries.